Today's welding requirements have become more stringent with regard to the quality and appearance of a typical weld. Manufacturers are addressing quality and consistency issues by looking more closely at all parts of their welding operations. Here, we look at welding system components, and focus on those that may have been ignored in the past, but are vital to producing small parts. Quality in all manufacturing areas is now demanded, rather than hoped for or applauded when received. Welding, the last process in the manufacturing cycle, is also subject to this demand and has been making its own changes to keep up with changing times. It also seems to be a general trend that most modern products are becoming more physically compact. Thus, it is incumbent upon the welding process to be more precise and to apply the right amount of heat in exactly the right place. In short the modern world requires precision welding, welding that can be repeatedly executed within a close set of tolerances. What Kinds of Miniature Parts Require Precision Welding? A surprisingly large number of products, including batteries, capacitors, sensors, pressure devices, light bulb filaments, metal bellows and seals, and surgical tools, require precision welding to seal, shape, or join to complete the manufacturing process. Not only must these welds be extremely reliable because of the product's critical nature, they must also be created without compromising the device's function. Welding is considered by many to be more of an art rather than a true mathematical science. It seems to change gradually rather than quickly, and often lags behind the other manufacturing processes in investigating the full details of its own technologies. Progressive manufacturers are now changing this thought paradigm and are willing to investigate any technology that can improve output consistency. The science of welding is extremely complicated with an immense number of variables to consider, not only in the welding processes and equipment available, but also in the detail of consumable elements and how they affect the welded output. In the manufacturing industry, the two most popular methods used for precision joining are the TIG and plasma weld processes. TIG and plasma welding processes were originally developed to provide a means to produce acceptable weld quality on a variety of metal materials and alloys. Advances in power supplies, welding techniques, and process controls have allowed for greater weld accuracy. The process is now used in even more precision and miniature applications. In the Gas Tungsten Arc Welding process (GTAW), also referred to as the Tungsten Inert Gas process (TIG), an electric arc is established between a tungsten electrode and the part to be welded. To start the arc, high voltage breaks down the insulating gas between the electrode and the workpiece. Current is then transferred through the electrode to create an electrode arc. The metal to be welded is melted by the arc's intense heat and fuses together. The plasma weld process is a TIG welding variant with an additional copper housing around the electrode that directs and further constricts the arc. Both processes use a Tungsten electrode ground to a point both as the source of the arc ignition and as an transfer medium. Welding Power Supply: Historically, welding power supplies were often large crude devices to deliver electrical power to a welding arc. Power supplies have been improved, and now offer faster response, with accuracy and reliability in a more compact design. Arc Starters: High frequency arc starters were the primary means of starting a TIG arc. Now, the welding industry also offers DC arc starters. These devices offer better arc starting, longer electrode life, and less electrical noise that may cause interference with other electrical or control systems near the welding system. Figure 1. 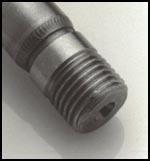 Two commercially available grinding finishes are compared to a manually ground electrode (lower) that many welders use. Crosswise grinding restricts welding current, and causes ignition problems and arc wander. Longitudinal grinding improves current flow. Welding Torches: Arc welding torches also have seen significant improvements. Modern GTAW and plasma torches are available in many styles and shapes, and provide current delivery improvements. Their designs have been improved, offering torches that allow for electrical power, shield gas(es), and any required water cooling, all in a device as small as the diameter of your little finger. Tungsten Welding Electrodes: Tungsten welding electrodes, the source of the welding arc, is the welding system's most important element, and the most commonly ignored. While no one would refute the importance of the ignition device on an automobile airbag, gasoline for a turbo-charged Ferrari, the violin strings for a Stradivarius, or the rip cord for a parachute, the importance of tungsten electrodes is often overlooked. Whether in manual or automatic welding, this is where many companies can improve their welding output's consistency with minor effort. Reduced tungsten shedding, minimizing the possibility of tungsten inclusions in the weld. A dedicated electrode grinder ensures that the welding electrodes will not become contaminated by residue or material left on a standard shop grinder wheel. Tungsten electrode grinding equipment requires less skill grind a tungsten electrode correctly and with more consistency. Tungsten electrode grinders are now available that provide all the necessary features for precision electrode grinding at a starting cost of about $750. Figure 2. These small parts were joined using an arc-welding technique. Note the pulsed arc finish on the weld surface. Arc Welding Parameters: Welding small parts, or welding near polymer or glass-to-metal seals, requires low heat input to the welded part. The pulsed arc welding technique, used both in GTAW and plasma welding, rapidly increases and decreases the arc welding current. This creates a seam weld in the part material consisting of a series of overlapping spots welds (Figure 2). It focuses the weld energy, allows for weld speed increases, and reduces the overall heat input to the part. Some welding component suppliers offer spreadsheets to calculate the required arc pulsation parameters for many precision/miniature applications. This eliminates the requirement that an engineer needs ten years of experience to analyze a welding application. Using these techniques, the welding department can improve it's output quality and repeatability. The trials and investigations of the past in advancing the welding process have brought new triumphs in welding, improving quality and precision, and leaving less waste. These are lessons that when applied, can offer modern manufacturing organizations an exceptional advantage over their competition. Available technology has revolutionized many manufacturing operations. In the current global marketplace, manufacturers are looking for ways to increase output, consistency, and quality. Organizations must open their eyes to the continually evolving world of manufacturing. The welding industry, although historically slow in responding, is now offering more and more to those who are willing to listen. For a company to increase market share, or even to remain competitive, it must find more efficient and better production methods. A willingness to test where the limits of existing technology really lie can result in more and better precision/miniature products at substantial cost savings.